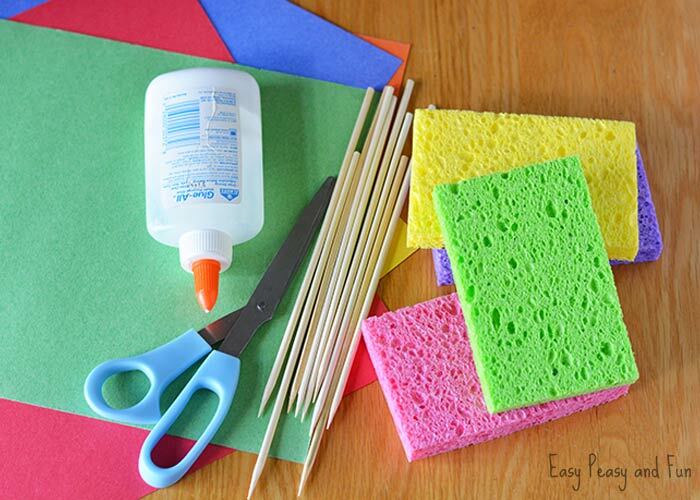 Trim your sponges with scissors. 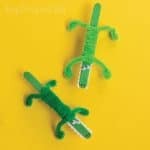 For the Green sponges, I cut the skewer with the wire cutter to about 5.5″ in length. For all other sponges, I used the full size, 8″ skewer. 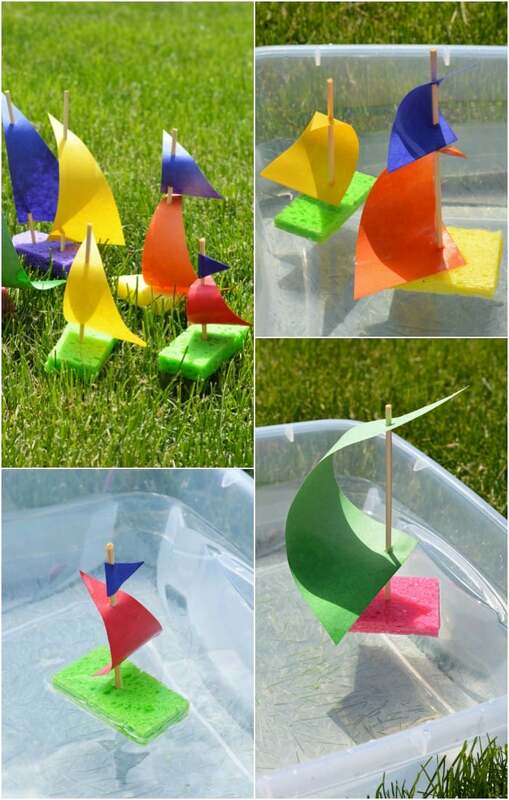 Create sails buy cutting triangles out of construction paper. 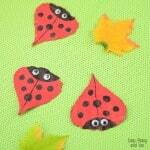 If desired, Fold a small piece of construction paper in half and cut a triangle out on the fold. 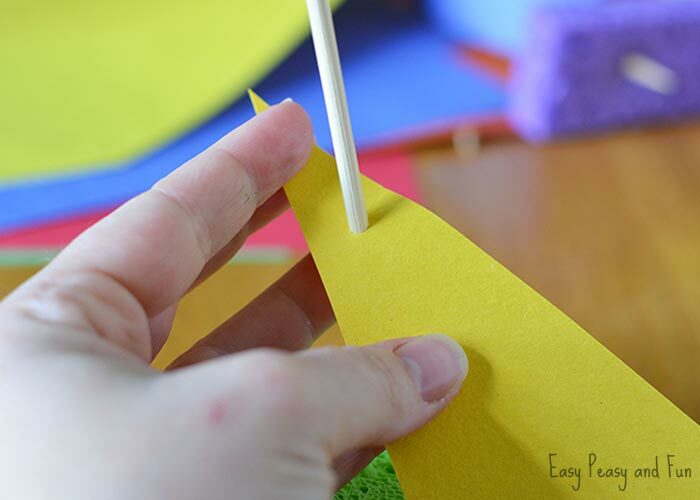 Glue the fold together on the top of the skewer. 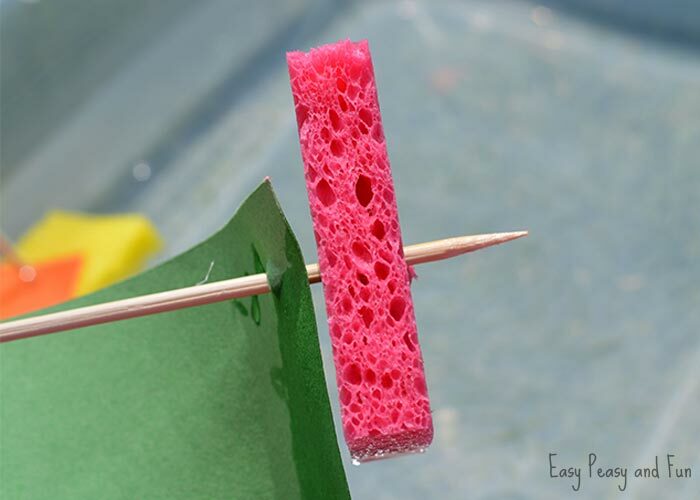 Poke the skewer into the sponge so that it goes through the other side at least 1″. Remove the skewer. 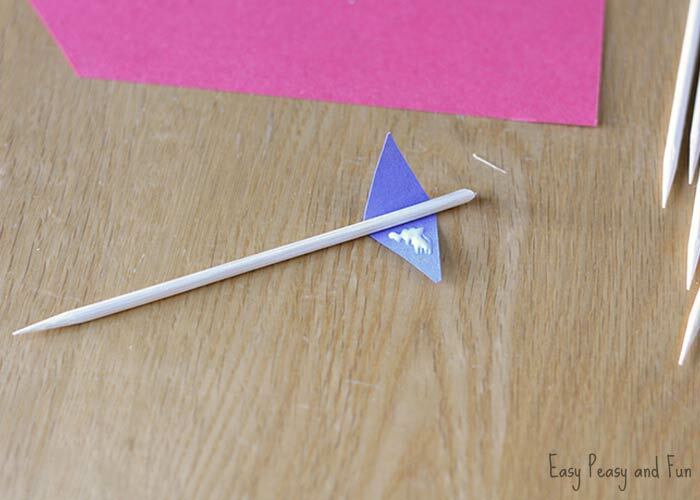 Poke a hole at the top of the construction paper triangle, along the long edge, and poke the skewer through the paper. 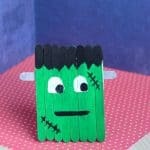 Keep the skewer about 1/2″ to 3/8″ from the edge of the paper. Your sail does not have to be taunt on the skewer, it can bend. 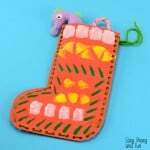 Push the skewer with the sail through the hole in your sponge. Adjust the sail as necessary and sail away. To sail. 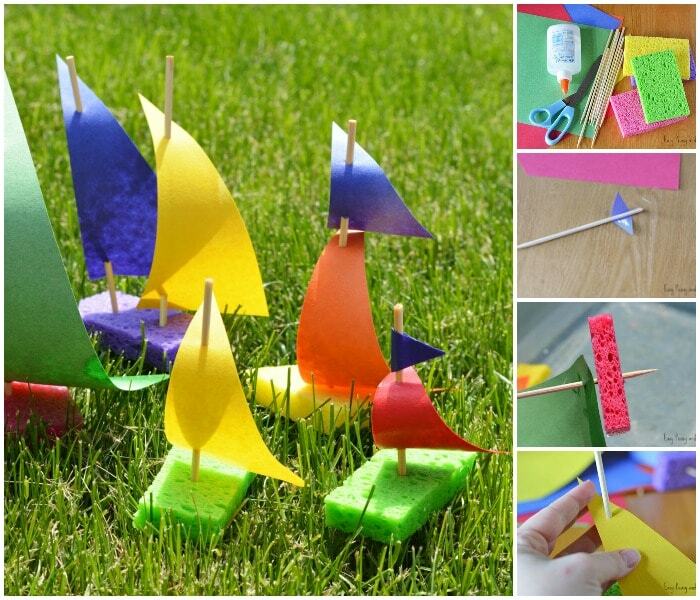 Place the boat into the water and let the sponge absorb water before letting go. 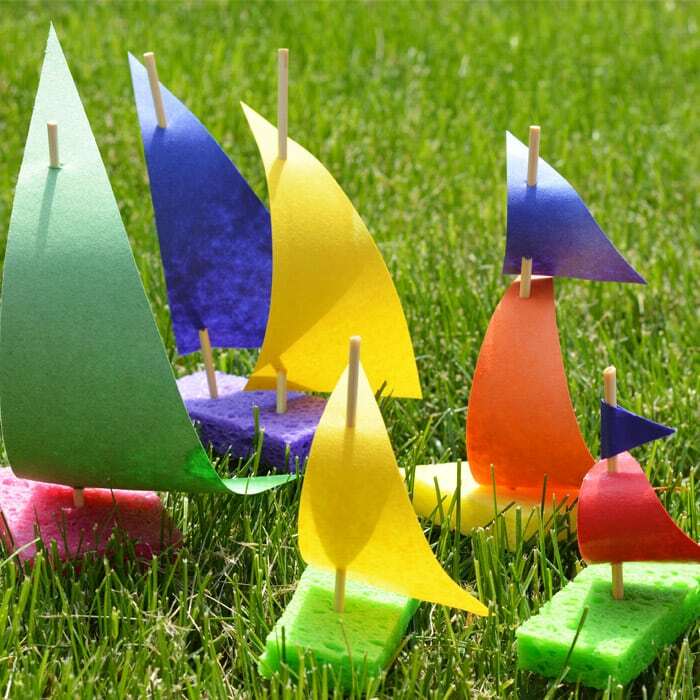 You’ll need to adjust the skewer up and down through the sponge and adjust the sail for optimal sailing. Note: They all tipped over at some point. And the sails got wet. But they still worked fine. It works best if the skewer pokes through the bottom of the sponge about 1-2″. 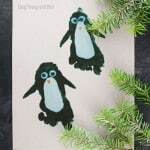 Clearly you can experiment with this! The purple boat was the worst. Two masts and it never did officially stand up! It kept toppling over. You may want to omit, unless you have a determined child in the group. Great idea! Fun and easy. Using for my Toddler Sunday School class in telling the story of Paul and his ship wreck…so I hope the boat tips or sinks!